We're getting behind Northern Ireland's finalist in the Heritage category of the National Lottery Awards 2018... and we need YOUR vote! HMS Caroline, the 100-year-old naval vessel and sole survivor of the World War 1 Battle of Jutland, has been announced as a finalist in the National Lottery Awards 2018. The ship, which opened in 2016, followed by the completion of a visitor and exhibition centre in the restored Pump House and refurbishment of Alexandra Dock earlier this year, was the recipient of the largest ever Heritage Lottery Fund grant of £11.5m in 2014. Since opening, Caroline has welcomed intrepid explorers curious to know what life was like during The Battle of Jutland, the largest sea battle of the First World War. When the ship reopened after the major refurbishment, we made full steam* to the Titanic Quarter and were one of the first for a look around (check it out here). Impressed at how much was packed in, we've kept a close eye since then on both Caroline and Belfast's growing maritime heartland. Tweet your message with #NLAHMSCaroline (FYI this hashtag is only for Twitter - does not work on Instagram). All voting is independently verified by the Electoral Reform Services - full details via link above. YET TO EXPERIENCE HMS CAROLINE? Visitors are taken on an immersive ‘Jutland Experience’ on board, from the sights and sounds of the devastation of battle to historic spaces such as Captain’s Quarters, Marines' Mess and the heart of the ship; the Engine Rooms which drove HMS Caroline through the historic war years. The Pump House is also home to an extensive visitor and exhibition centre featuring much of the original Edwardian era machinery and technology, medals and artefacts from those who served on board. AND KIDS GO FREE ALL SUMMER! With the July sunshine back for another (short?) blast, we made the most of it and headed for a walk down Belfast's new 'Maritime Mile' - stretching from the 'Big Fish', past Titanic Belfast and on down around the Alexandra Dock. Chatting with the HMS Caroline team while there (Max lapping up the attention), we learnt a few more facts, on top of those from our original visit for the reopening last year (Max sat that one out...). That’s 104 human years - the ship launched on 21st September 1914. The light cruiser is 135.94 metres, originally constructed in Birkenhead shipyard, taking nearly a year to complete. That's 3,750 tones - over the years the ship actually gained weight with the addition of features including an on-board firing range! The "Jutland Grey" paint (as it became known as) used to return the ship to its original colour weighed 5 tonnes! And is the sole survivor of the Battle of Jutland - the only major naval battle of World War 1. She become the static, floating headquarters of the newly formed Ulster Division of the Royal Naval Volunteer Reserve - active until as recent as 2009. ...a fitting reminder of those who lost their lives at sea in World War 1. This includes the restoration of the ship, the Alexandra Dock and the Pump House, over a period of four years. This was funded by the HLF and NI government. ...by the same team who created sets and items for the Game of Thrones and Star Wars series. This is probably one of our favourite parts from when we had our tour. The noise! Though animals can't climb aboard the ship - too many tricky holes on the walkways for one - there's still plenty to explore around the Alexandra Dock area. It's a great route to walk the dog and you can actually walk the whole way round the ship. 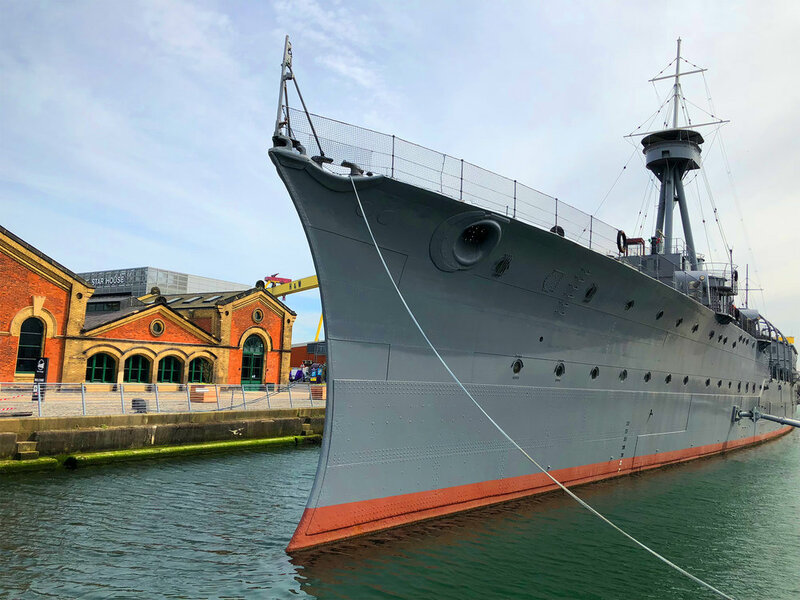 If you're heading, make sure to check out the view of HMS Caroline from the bridge at the front...and also check out the new Cafe 1404 there. It's dog-friendly too! The project is Northern Ireland's finalist in the National Lottery Awards 2018 (Heritage category) and needs your vote! Full details at the top of this page - click here to jump there.